What's Driving Shares of New Age Beverages Corporation 10% Lower Today? The company's shares are lower today as investors take a breather from a month filled with speculation and rumors. Shares of New Age Beverages Corporation (NASDAQ:NBEV), a developer, marketer, and distributor of ready-to-drink products aimed at health-conscious consumers and also the Cannabidiol (CBD) market are down 10% as of 3:37 p.m. EDT, as the highly volatile stock continues its wild ride. Here's a better look at just how volatile the company's stock has been this month. Part of the recent hype and speculation over the stock price has been driven by the company's new focus on CBD-infused, cannabis-inspired products. The hype continued to mount recently as New Age Beverages presented at the 4th Annual B. Riley FBR Consumer & Media Conference on Oct. 4, and then later at the North American Convenience Store show in Las Vegas on Oct. 8. That gave the company plenty of time to show off and talk about its cannabis-inspired drinks, as well as discuss distribution with store operators and suppliers. "The demand and interest for these products is unlike I have ever seen in my career. Customers loved the taste of New Age's CBD-infused products and many of them committed to bring in the products for sale," commented Michael Cunningham, senior vice president of sales for New Age Beverages, in a press release. Going forward, the company's new product line of CBD-infused drinks offers investors an intriguing growth story. It's especially attractive when you consider that the company's functional teas, sparkling coconut water, and coffee product sales were slowing throughout 2018. Part of today's decline simply was due to investors taking a breather after the stock spiked on days with roughly three times its average trading volume. Only a little more than 9 million shares traded hands today, well short of the 16 million average. New Age Beverages has a market capitalization of only 288 million, making it an easy acquisition target for larger beverage companies, and 20% of its float is sold short. 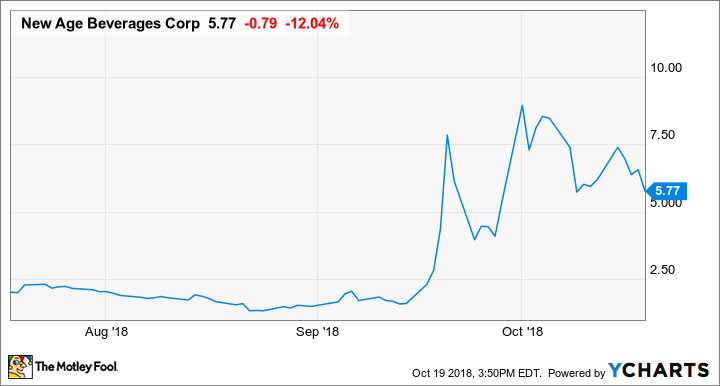 The company will remain a highly volatile stock that's driven by speculation, rumors, and broader cannabis trends.